What a welcome and lovely sight this flower is in the late spring! 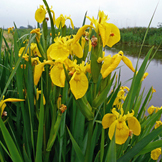 It loves wet conditions such as in bog lands, and can also be readily cultivated in water features in gardens. Large stands of seggan in western Scotland form a very important feeding and breeding habitat for the endangered corn crake.